Last week I had a strawberry and basil sorbet at a nice restaurant. I was hesitant at first to even try it because I couldn’t imagine strawberries and basil pairing well. But because the sorbet was served with panna cotta, one of my favorites, I couldn’t resist. I was glad I took a chance because I found the sorbet was refreshing and the flavors worked well together. It tickled my taste buds in a way I hadn’t imagined. Sometimes taking a chance with flavors pays off. I was recently challenged to come up with a dessert recipe using an interesting ingredient. Not one to back down to a challenge, I thought long and hard about this non-traditional product for sweets. How would I be able to incorporate this into a recipe that not only looked good, but tasted good as well? 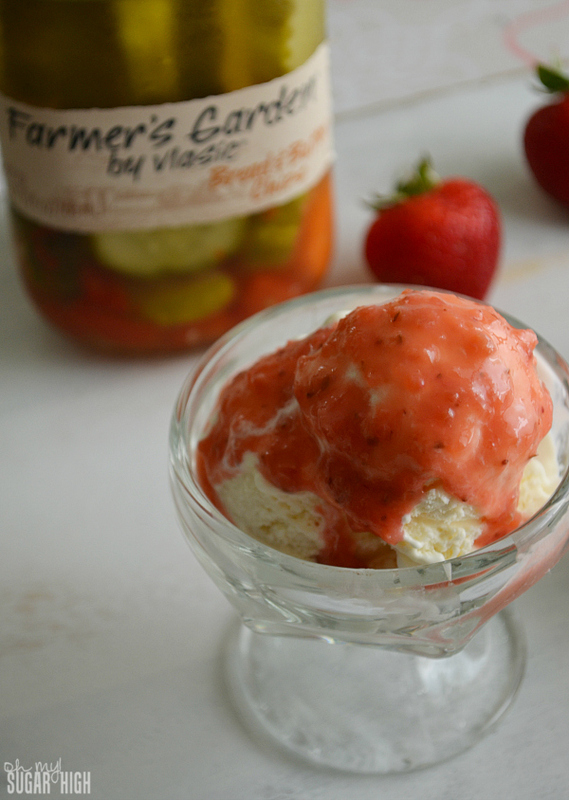 Vlasic asked me to come up with an original dessert recipe using their Farmer’s Garden pickles. With so many unusual pairings in the foodie world today such as chocolate covered bacon and sea salt brownies, I knew it was certainly possible. 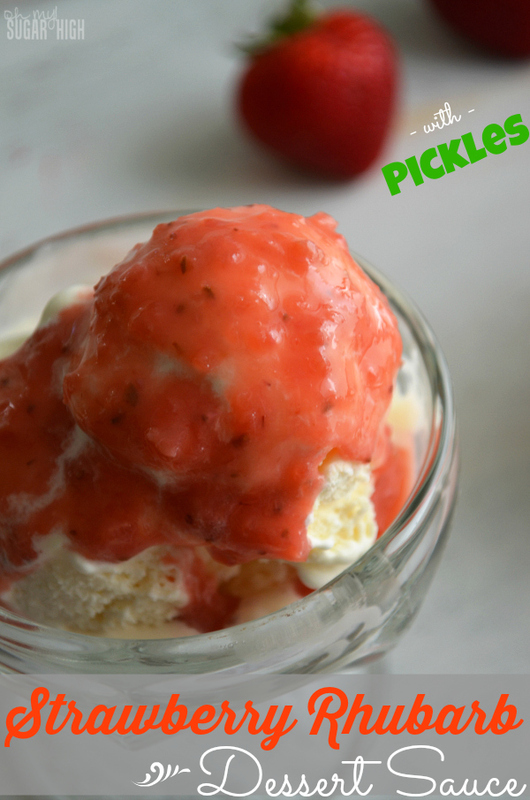 When I think of pickles and sweets, I think of pickles and ice cream. Cliche, perhaps, but I decided a dessert sauce that I could pour over ice cream would be a great option. I decided that their bread & butter pickles would pair well with something extra sweet like strawberries and something tart like rhubarb. 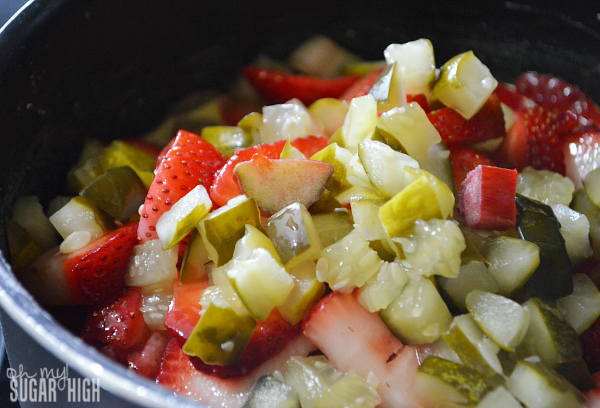 And so, this Strawberry Rhubarb Sauce with a surprise ingredient was born. In medium saucepan, combine sugar, orange juice, cornstarch and vanilla. 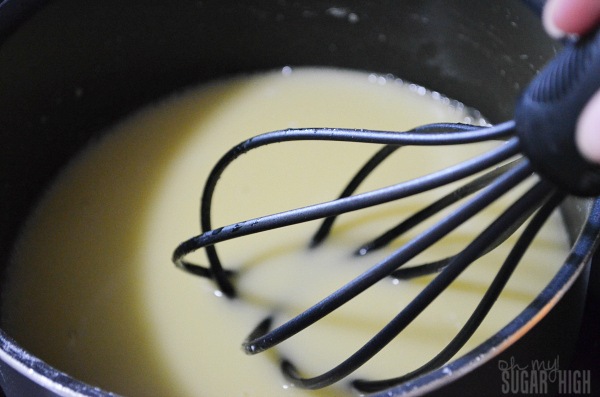 Over medium heat, whisk ingredients until completely combined. Bring to a boil. Add strawberrie, rhubarb and pickles. Reduce heat and simmer, stirring occasionally until tender, approximately 10 minutes. Remove from heat. For a chunky sauce, mash with a potato masher or fork. For a smoother consistency, pulse in blender until smooth. (An immersion blender or sports blender works great. ) Cool and let sit overnight in fridge to let the flavors settle. Serve warm or cold. The process is really quite simple, and can be prepared in less than a half hour. I started to question my madness when viewing the contents of my pot, but continued on, undeterred. Originally I wanted a chunky sauce or compote. 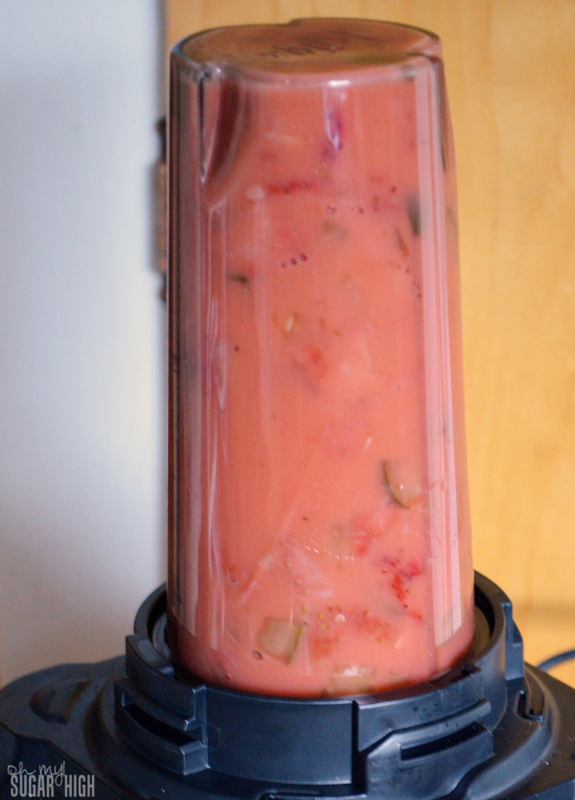 But after tasting it, I realized that getting a chunk of either pickle or rhubarb was a bit overpowering. 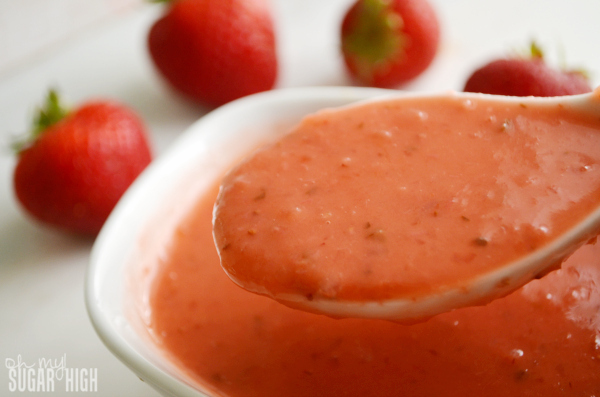 I decided to blend the ingredients together to create a smooth sauce that would even the flavors out. The end result was not only visually appealing but tasted great as well! I liked the flavors immediately after cooking but even more so after it sat overnight in the fridge. The real test came when I asked my two boys (ages 6 and 7) to try it out, not evening mentioning the secret ingredient. They both gave the sauce two enthusiastic thumbs up and since they are my toughest critics, I knew I had a winner with this recipe. While this sauces pairs well with ice cream, it would also taste delicious on your favorite cake such as pound cake, angel food cake, bundt cake or even a rhubarb cake. 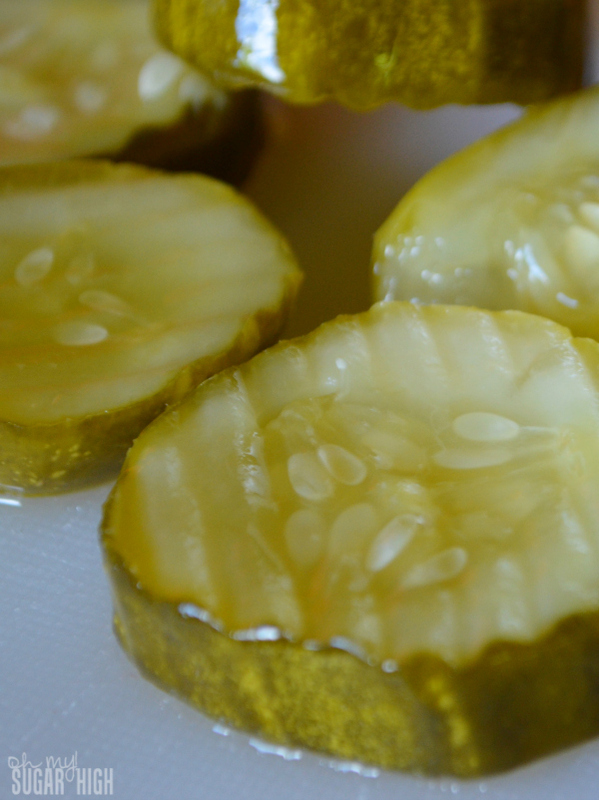 Have you ever tried a dessert with pickles? 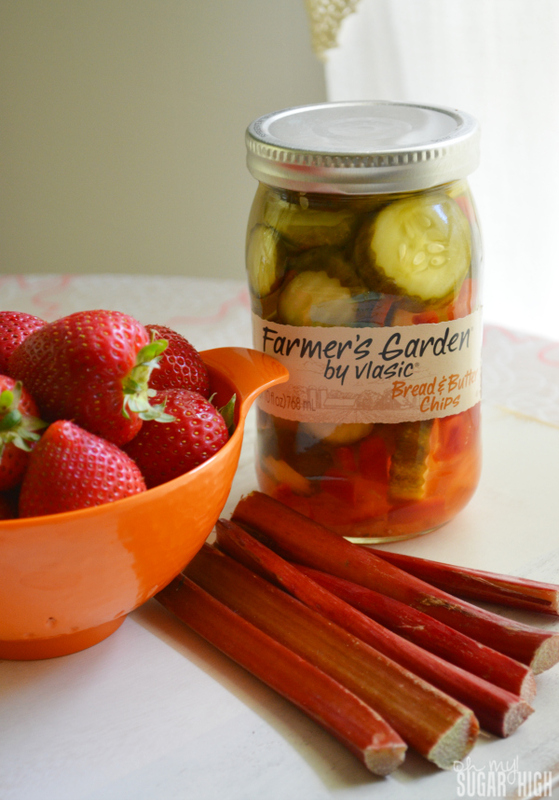 Farmer’s Garden by Vlasic kicked off a program called Savor Simplicity this past May, meant to celebrate life’s simple joys and share recipes, BBQ tips and summer entertaining ideas. They share so many delicious and unique recipes! And even better, righ now they are holding a Savor Simplicity Sweepstakes, where you can enter for a chance to win a summer entertaining package valued at $1,500. As an added bonus, entering the Sweepstakes unlocks a $1 coupon for Farmer’s Garden. See full contest rules. Disclosure: I received compensation for my time to create this recipe and post. All thoughts are my own.